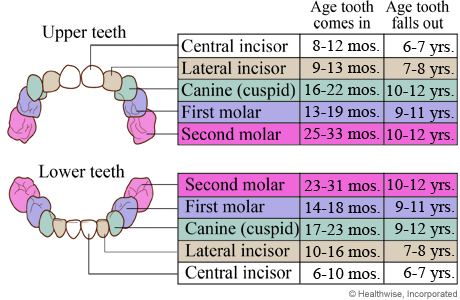 Even before your baby was born, little tooth buds were developing under the gums. FYI did you know, calcification begins at 4 months in utero? That means, when the mother is 4 months pregnant, her baby's teeth begin to calcify!!! Moms to be, take your vitamins and get lots of calcium! So when do baby teeth start to appear? generally around 6 months after baby is born. Rest assured that this is a rough guideline. It's perfectly normal for a baby to show his first tooth as early as three months, or as late as his first birthday. Sometimes, babies are even born with a tooth!! This is called a neonatal tooth. Typically it takes between two years and three years for a full set of gleaming baby teeth to appear.